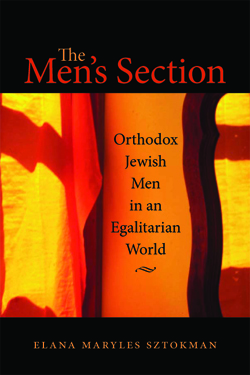 Elana's first book, The Men's Section: Orthodox Jewish Men in an Egalitarian World, investigates a fascinating new sociological phenomenon: Orthodox Jewish men who connect themselves to egalitarian or quasi-egalitarian religious enterprises. Elana examines the men who have enabled these transitions by constituting the requisite ten-man prayer quorum of Orthodoxy. By participating in "Partnership Minyanim," these men support the reconstruction of both male and female roles without leaving the Orthodox religious world. Sztokman interrogates the ideologies and motivations of more than fifty such men in the United States, Israel, and Australia. Beginning with the "Orthodox Man Box" of conventionally constructed male behavior, she explores their struggles to navigate individualism and conformity, tradition and change. Setting their experiences in the context of gender role construction in traditional and contemporary synagogues, she shows how, for example, changes in leadership in Partnership Minyanim facilitate a fresh approach to liturgical expression, offering the possibility of reforming how modern Orthodox Jews attend services and pray. For decades, those who support gender equality have believed that challenging Orthodox Judaism was a non-starter, an impossible dream. After all, aren't these the guys whose morning prayer includes thanks for not being born a woman? And yet, from deep within the modern Orthodox temple come rumblings of change. Led initially by pioneering feminist women, Orthodox Jewish men are coming to see how gender equality is the fruition, not the antithesis, of their religious vision. This extraordinary book highlights the imperatives and the struggles towards that vision." The Men’s Section is an important book telling a surprising story. Turns out the Orthodox men in egalitarian minyans aren’t there just for their wives. They’re reshaping their own masculinity, and thereby transforming the men’s club that is orthodoxy, seeking fulfillment in feminist values of emotional connection, albeit in often unconscious and contradictory ways. By insightfully examining men as agents of change in the Jewish gender order, Sztokman contributes to courageous efforts to pursue greater Jewish gender justice.